Down on Main Street in Dallas’ bustling and vibrant downtown comes one of the Metroplex’s top seafood dining experiences, the Dallas Fish Market. The Dallas Fish Market opened their doors in 2007 and has been a great catch for locals and visitors alike who are craving an incredible taste of the sea. Dallas Fish Market’s newest feature to their extravagant restaurant is their Raw Bar, which opened in mid-2018 and has been a widely successful edition to the restaurant. Their Raw Bar boasts some of the finest and freshest seafood in the metroplex, from oysters and caviar, to poke bowls and sushi, the raw bar has everything you could possibly crave. For starters, I was given an oyster tray with four variations of oysters. Two of the oysters, the Beausoleil and Salt Grass Point oyster, are imported from Canada, while the other two oysters, the Olde Salts and Duxbury hail from Virginia and Massachusetts respectively. If you are a fan of oysters, then you will certainly appreciate the freshness and quality of the oysters at Dallas Fish Market. The oysters here are some of the best I have ever had, and that includes various trips to the east coast, as well as the gulf. Often times it is difficult to find good oysters so far from the ocean, but Dallas Fish Market does not disappoint with their exquisite selection. The second item on the menu I was given was the Sunshine Roll, an impeccable Makimono roll that rivals any sushi I have ever been served. 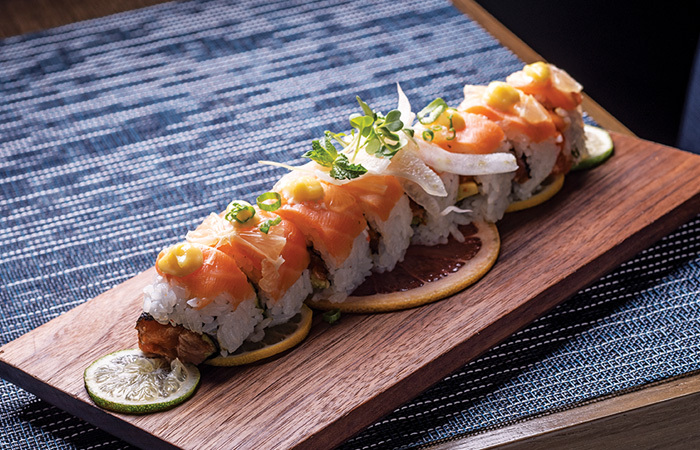 This sushi roll features Patagonian salmon, citrus, avocado, spicy mayo, and nori. The plating of this roll is wonderful, and is also where it gets the name “Sunshine Roll.” The vibrant sushi roll sits on slices of grapefruit in the center, followed by lemon and lime slices, giving each piece a unique and stimulating flavor. Poke bowls have become the latest trend in seafood and Asian cuisine, and Dallas Fish Market’s take on this dish is definitely worth a try. I tried two different poke bowls they serve, each with their own unique flavor and style. The first bowl I had was the Spicy Peanut Thai Shrimp bowl. This poke bowl consists of tempura shrimp, candied peanuts, Thai basil, spicy peanut sauce, and orange supreme. This bowl is served cold in a bed of Thai noodles that are heavy with peanut flavor. 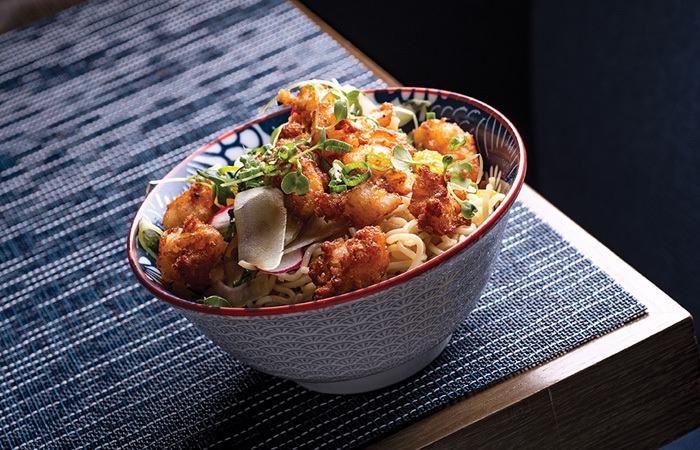 The best part of this dish is the fried tempura shrimp. Marry the breading and flavor of Chick-Fil-A with shrimp, it’s simply a bite of perfection. Don’t be alarmed of spicy in the name, it is not nearly as spicy as the name suggests. The final item I had the pleasure of trying was the Wasabi Tuna bowl. This bowl is packed full of flavor and the perfect dish for those who love a little spiciness in their food. The Wasabi Tuna bowl sits on a bed of warm sticky rice, topped with tuna, jalapeño, pickled onions, edamame, and daikon, as well as fish eggs sprinkled throughout the dish. Much like the previous bowl, don’t let the term wasabi scare you away if you are not a fan of spicy foods, it is not too intimidating or harsh. The tuna is seasoned to perfection, and the fresh jalapeño is where the spice really comes from with each bite. The sticky rice has a little sweetness to balance out the spice, making this bowl bold and unique. If freshness and seafood in a modern and unique atmosphere is what you desire, then look no further than the Dallas Fish Market. It is the perfect spot for lunch during the work week, a nice dinner with your significant other or friends and it certainly is an excellent spot for putting a few drinks back over some sushi or oysters after a round of golf. Head over to Dallas Fish Market to get your fill of some of the finest seafood in the Metroplex.